The SkySaver Personal Rescue Device - 260 ft. allows an individual (weighing between 66 – 300lbs) to escape from a multi-story building, as high as 25 floors, with a descent speed of 6.5 ft. per second. This portable and easy to use device was created by a team of highly trained engineers and assessed by industry stakeholders; including firefighters, defense force personnel and more. Each SkySaver Personal Rescue Device is tested by an industrial grade machine prior to sale. The design is certified to meet ASTM and ANSI for Multi-story Building Evacuation Controlled Descent Devices. 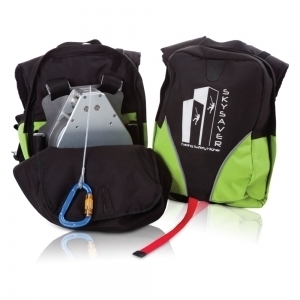 To use SkySaver Personal Rescue Device, the user simply puts on the backpack; hooks the galvanized steel cord to the preinstalled anchor point and then proceeds to the window and allows the friction based breaking system descend the user to safety. * The Skysaver comes in 3 lengths. See the other sizes in related items below.